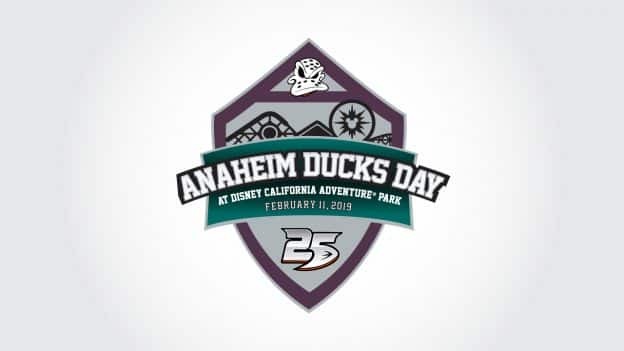 As we previously announced, Disney and Anaheim Ducks fans alike can take part in Anaheim Ducks Day at Disney California Adventure park on Monday, Feb. 11. Visit Stage 17 to check out a selection of Anaheim Ducks memorabilia from the past 25 years, including jerseys, sticks, helmets, trophies and more. While you are there, test your hockey skills, or challenge your friends to air and table hockey. A very special mascot will also be there for greetings and photo opportunities. Pick a spot along either Hollywood Boulevard or Buena Vista Street to see some of your favorite Anaheim Ducks players in a cavalcade! 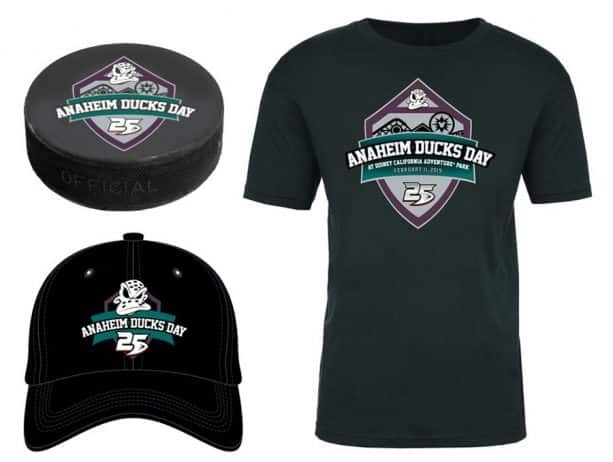 Outside Stage 17, pick up special Anaheim Ducks Day merchandise, including apparel and baseball caps, as well as limited-edition prints, pins and hockey pucks. Merchandise is limited and available while supplies last. Purchase limits apply. No discounts allowed. Relive memorable moments from the past 25 years of Ducks hockey. Film features include the 2003 run to the Stanley Cup final, the road to the 2007 Stanley Cup championship, Teemu Selanne and Paul Kariya jersey retirement ceremonies and the 10th anniversary celebration of California’s first cup, when the entire team reunited and took the stage to share stories from that historic championship! Don’t miss out on a limited selection of specialty treats inspired by the Anaheim Ducks 25th Anniversary. 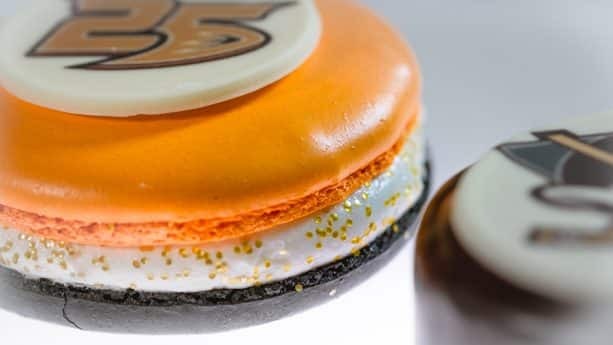 Taste an orange cream puck at Trolley Treats, anniversary-inspired macaron at Studio Catering Co. or hockey puck-themed brownie at Schmoozies. Throughout the day, learn how to draw some of your favorite Disney “ducks” with our Animation Academy artists. The team has even added a few new Disney Ducks to their line-up for one day only! 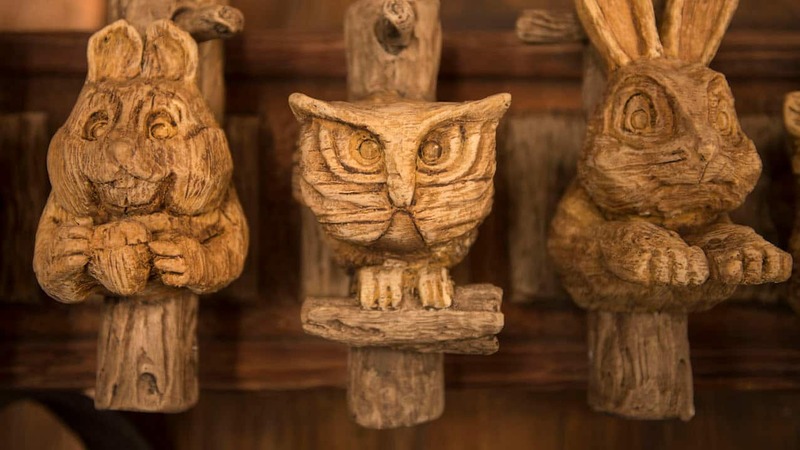 When you’re done, you get to keep your art as a souvenir! Please visit the Animation Academy for operating hours and show times. The Anaheim Ducks announced that the National Hockey League (NHL) club will highlight their 25th Anniversary with a Silver Celebration Week from Feb. 10-17, 2019. For more information, visit AnaheimDucks.com/SilverCelebration and join the social conversation by using #Ducks25. Schedule, events and appearances subject to change or cancellation without notice. Theme Park admission required. *For the meet-and-greet experiences, wristbands for your choice of one (1) meet-and-greet experience per guest will be distributed at park opening in the Hollywood Backlot area. Please enter the wristband distribution queue available at park opening as you enter Hollywood Land. Wristbands are limited per experience and available while supplies last. Wristbands may not be sold, have no cash value and will not be replaced if lost, stolen or damaged. Wristband processes are subject to other restrictions and change without notice. No autographs will be given; please do not bring any items to be signed.